For smallholders, agriculture development and healthcare suffer a common ailment; ineffective last mile services. In the Agrarian Indian State of Manipur, these challenges are exacerbated due to deep-rooted socio-political challenges. This has left the population to be amongst the poorest and most marginalized groups in India. There has been a concerted effort by the State Government to develop a network of service providers, however, as seen around the world, each service provider, agriculture extension provider or a primary health care center, works independently in reaching out to the same set of people, when much could be achieved by leveraging each other’s efforts. 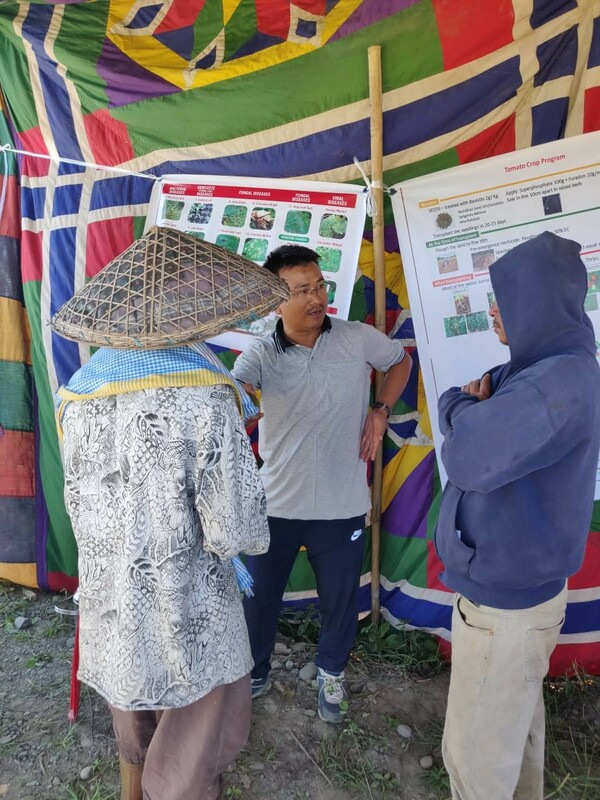 It is important to note that while Manipur is one of the 18 focus states under the National Rural Health Mission (2005), some of the farmers we have interacted with have never been to a healthcare center. Similarly, Soil Health Card, a Government Scheme promoting soil tests that was launched with much fanfare, is still at its infancy as existing facilities are yet to run a productive test till date. This gap in services has left farmers unhealthy and underproductive, further pushing them into a vicious cycle of low output, poverty, and poor health. In this context, a ‘new approach’ is vital. New challenges beget new solutions! 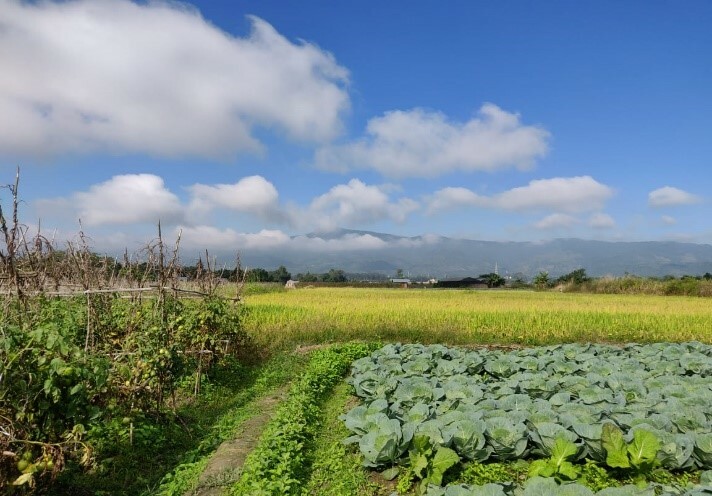 MaolKeki Foundation (MKF) and Syngenta Foundation India (SFI), have collaborated to work on creating an ecosystem of high-quality services to smallholder farmers. 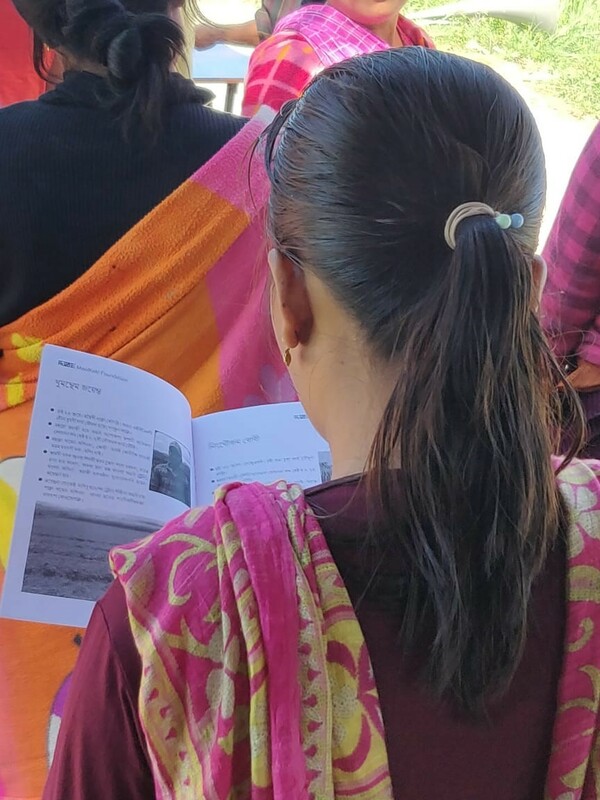 In December 2017, MKF started operations in Manipur. The baseline suggested a dire need of health checkups as farmers had not seen healthcare practitioners in years and generally complained of multiple health issues. 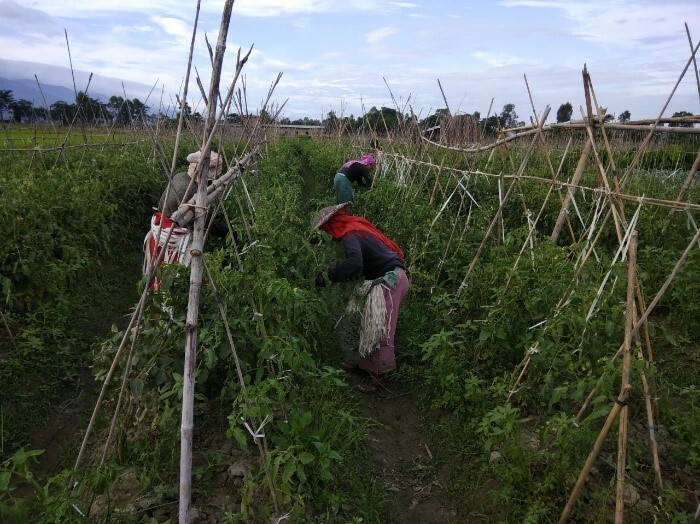 Despite lack of facilities and information, these farmers were very industrious, working season after season, mixing tomatoes with beans, cabbage, and local vegetables. However, much is left to be desired in terms of yield, productivity, soil management, and market linkage. MKF decided to work with a few Lead Farmers, to nurture them as on-ground leaders and educate them to be progressive farmers. Farmers were quick to adopt modern practices for tomato cultivation and saw impressive gains in yields with very high returns on their investments. Close to the end of season, MKF and SFI organized Demonstration Days. Farmers were brought to the fields of these ‘Lead Farmers’, exposing them to better agronomy practices. It was here that the confluence of Agriculture and Health Services took place. 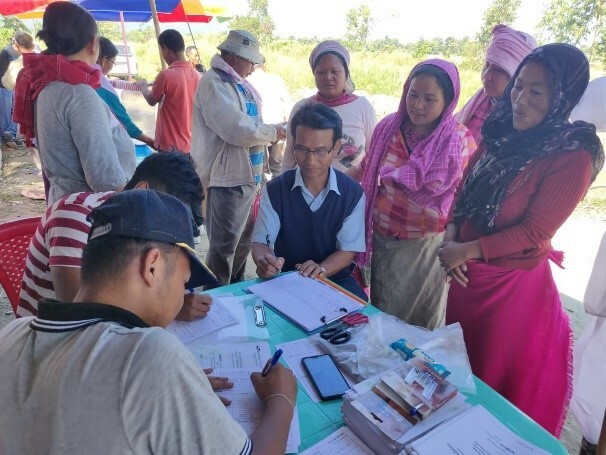 Health check-up camps were organized for farmers who visited the demo sites. The three demonstration days saw a footfall of over 300 farmers. Farmers engaged in extensive Q&As regarding vegetable cultivation and handouts regarding best practices taken up by the lead farmers were given out. The health checkup lines were long and farmers thronged the sites. The ‘Lead Farmers’ being from the same village are well known and trusted by other farmers. Recognizing them in the handouts and seeing their success convinced the other farmers of the value of advice that was being shared. Many of them were diagnosed with vision problems and follow-up dates for further treatment were decided. With this model, a platform providing key services to the farmers is underway. MKF in collaboration with SFI will be starting a soil testing laboratory which is much needed in this area of predominant vegetable cultivation. The facility will be launched by March 2019 while plans are in place to recruit and assign a healthcare worker who can provide door-to-door healthcare rather than wait for farmers to come to the demo Days. 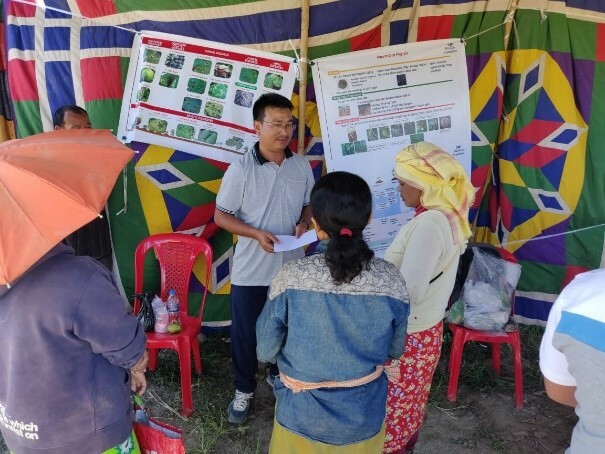 Working together with health care providers, we hope to see a healthier future for Manipuri farmers, who in turn produce better crops for the Manipuri population.